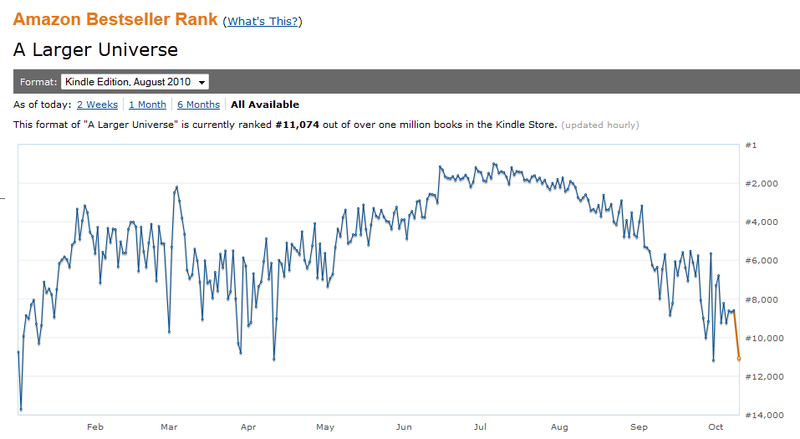 My novel has been drifting downward in the Amazon bestseller list. I had hoped for a longer run. Next Post Two things on my mind today. I’m actually impressed your book sustained decently for so many months for a first private release. What were your total sales overall so far? I’m about to release my own novella on Amazon, so any advice you have in hindsight would be appreciated. I don’t have much in way of advice. The above graph has a logarithmic component, in that the difference is sales for someone at 1000 level and someone at the 2000 level is at least a factor of ten. And I would suspect between 1000 and 900 is another factor of ten in unit sales, and between 900 and 800, another factor of 10 and so on down to number one. The most I ever sold was about sixty a day. That lasted one day. I’ve made less than $12,000 so far on a novel I’ve spent maybe 10,000 hours in writing, editing, re-editing, getting feedback from a writer’s circle (I spent a year of weekly meetings doing that) and editing again. This is not a way to make money. It took off when it started getting good/excellent reviews. It is still getting excellent reviews. The people who read it seem to like it. So my only advice is write something that people like. Which brings me back to the main post. I don’t have a clue as to how to find more people that like this sort of thing. It apparently took off based on word of mouth. Now I need more words. I wrote this first novel because I have always wanted to write a novel, thought I could write a novel, and felt that no-one was writing the kind of story I enjoy reading. I will always be grateful for the good reviews. Someone else enjoyed my words. James, I’ve worked at (major chain) bookstores for many years and as such have had the opportunity to read hundreds of sci-fi / fantasy books from all the best writers in the field. Just bought the new Kindle Fire HD and yours was the first book I’m reading on it. 81% through after 2 days and I’ll probably finish in 3. I like the very easy reading feel to your style and enjoy the way you handle the higher science issues. Reminds me… somewhat… of Orson Scott Card’s “Enders Game” style. It’s a very enjoyable read and am looking forward to the sequel…. “An Emergent Universe”. I hope you can keep em coming. I think I’m a fairly good judge of talent in this genre by now and I think you definitely have what it takes to succeed. Just remember the old adage….do what you love and the money will follow. What you need to do next is finish up the sequel and you will see the first book go thru another run like the first time it was released. A follow-up always sparks new interest in the earlier books in a series. Good luck. I really enjoyed the book and am hoping that you will release additional books asap. Wow 10k hours? I agree with Jack on this. Releasing your next book in the series will help your initial book also I am not sure how Amazon releases book notifications with suggestions that I seem to get twice a week but a compromise of a lower book price for a week or so with you in the email blast will gather a much larger audience and feedback which will drive sales. You might want to consider it when your next book is ready for release. $12000 is probably more than I made all year. I bought the book yesterday and finished it today. Great story.Sorry you didn’t become a zillionaire on your first book, but I hope it doesn’t stop you from writing another (a sequel maybe?). I’ll buy one. I agree with Jack and Russell. You’re a good writer and you’ll get there. I liked the book as it kept me interested. Will there be a follow-up? Yes, I am working on a sequel, though the fantasy novel I have in progress will probably be finished first. I am happy you liked it. If you want to sell more, I’ll be frank, I think you need to get with better writers. You want to write with people who will tear your guts out. You’re probably a giant of a writer among your peers, but you’re not ‘a Niven’ just yet. As with becoming a better developer, try to surround yourself with people who are better than you are. Send Stross your best chapter along with a plot brief and ask to be humbled. I enjoyed this, and I would put it up with some of my particular favorites, The moon is a harsh mistress and Footfall. If you continue with the sequel as you have started it may even close in on the Ender saga. I think your limited sales are your lack of effort in reaching your audience. Without embracing social media you really are giving up. Particularly with the recent panel debate starring Brian cox you could have doubled your figures to date in a week! Embrace Twitter and Facebook and I think YOU are capable of spawning a new generation at young science fiction readers with your easy to read style and interesting programming detail. Think. Heinlein had Boys Own as a platform. Social media is yours. Inspire a new audience to put down call of duty rather than hoping the old generation will buy enough copies. I look forward to the sequel and j if it begins sometime after the other ends please consider releasing a short story to bridge the gap. New reader’s are used to 24 and harry potter where we don’t miss any of the action in between even if it is only an ebook copy. I have used Facebook to little avail, and I don’t have a following on twitter. I appreciate your comments, though. Really I have tried to find you and the book to no avail. You certainly do not have a fan page. Unless it was the one simply the name of the book with no picture.